"I'm an Englishman, therefore I'm a dog lover..."
Since series one of The Avengers John Steed had several dogs. The animals lived in his flats, but they were not present in all episodes. It's unknown if the animals were Steed's dogs or if they did belong to friends or if he took just care of them. Each dog appeared only in a few episodes, then they "disappeared" into thin air. Steed already had a dog, a Great Dane called Puppy, in series one as seen in the episode Ashes of Roses, where a big dog enters Dr. Keel's surgery with Steed (88). This first Great Dane - the dog's real name was "Juno"- was female like all other dogs of Steed. Keel asks an injured Steed in Ashes of Roses if he can do anything for him. During the Cathy Gale era, Steed owned four different dogs: Freckles and Sheba were Steed's pets in series 2, followed by another Great Dane (Junia, the sister dog of Juno from series 1) and the third Great Dane Katie in series 3. Steed's dog was mentioned for the last time in The Outside-In Man when Quilpie brings two dozen shin bone for the dog (only in the script) to Steed's flat. From series 1 to 4 Steed was a great friend of dogs and he still said in The £50,000 Breakfast that he is an "Englishman, therefore...a dog lover", but the dogs were not longer allowed to live in his flat from series 5 on. And Steed once owned another dog, a Borzoi, a Russian wolfhound, as he told Clover, the butler in The £50,000 Breakfast: "What a marvelous dog. I used to have one myself. They need an awful lot of exercise of course." In series six episode Take Me to Your Leader he tells Tara King that there is no room in his flat for the wonder dog Fang. 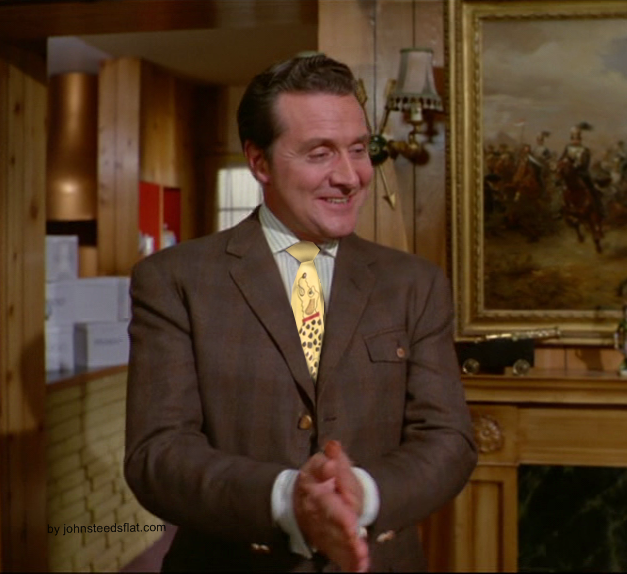 Mrs. Peel gave Steed a present in The £50,000 Breakfast: a tie with a Dalmatian on it. Venus Smith and Cathy Gale walked Steed's dog or took care of his dog, Emma Peel, and Tara King never did. He walked a dog with Mrs. Peel in The Hidden Tiger, but it was not one of his own and Samson, a little dog seen inside his second flat in The Medicine Men, belongs to the Lille girl. In series one episode Tunnel of Fear Steed's superior One-Ten is Puppy's (Juno's) dogsitter, while Steed works undercover at the funfair. Steed told Glover that he once owned a Borsoi (The £ 50000 Breakfast). During filming The Avengers Patrick Macnee owned a Great Dane called "Heidi," Steed's third dog Sheba was the dog of Kate Woodville, Mr. Macnee's second wife, who had portrayed Dr. Keel's finacée Peggy Stevens in Hot Snow and the girl at the bar in Death Dispatch.